Made in Michigan Gift Basket for sale. Buy online at Zingerman's Mail Order. Gourmet Gifts. Food Gifts. Guaranteed to cure homesickness for the misplaced Michigander in your life. 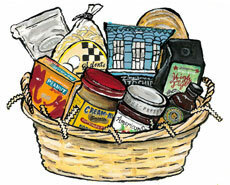 This handsome wicker gift basket is stuffed with a jar of Cherry Berry Spoonfruit preserves from American Spoon in Petoskey, a jar of Koeze’s Cream-Nut Peanut Butter from Grand Rapids, a bag of Al Dente pasta from Whitmore Lake, six all-butter Palmiers, and from here in Ann Arbor a bottle of Clancy’s Fancy hot sauce, a bag of Zingerman’s sea salt potato chips, a box of Zingerman’s peanut brittle, a bag of whole bean High Flyer coffee, and a loaf of Zingerman’s crusty Farm Bread.